Homemade Lipstick is an easy fun project, and it can easily be made with all natural ingredients. Over the past few years, I have been working on making everything else I use on my body homemade and/or natural as well. For more great homemade beauty recipes click HERE. First, I’d like to give you a few lip balm recipes. These are softer and great for healing chapped lips, or for just keeping your lips healthy. 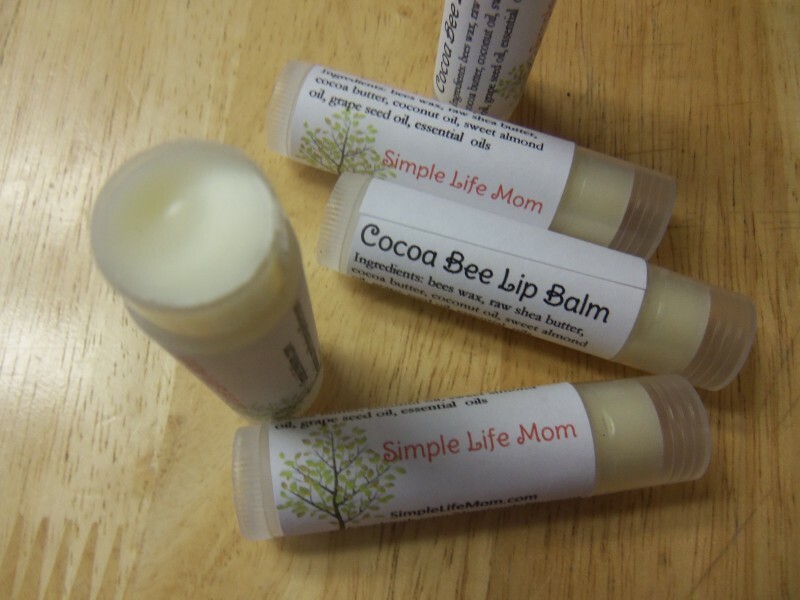 The first recipe has cocoa or shea butter and makes a bit of a harder stick, while the second is a bit softer, great for lip balm pots. This recipe will keep your lips soft and smooth. You can also mix and match your oils to create your own specialty lip balm. For ideas on coloring see below. For a more Matte texture: ¼ teaspoon bentonite clay. Use this with a color so it doesn’t leave a white tint on the lips. Gently melt all ingredients together on low heat. Remove from heat and allow to cool for a few minutes. Pour into lip balm tubes or pots. Stay away from lime, lemon, grapefruit, and bergamot essential oils which can cause the sun to burn your lips. This recipe will make about 2 tubes or 1 pot of lip balm. If you want to make a great LIPSTICK naturally, you are going to have to add a bit more color. Natural lipsticks seem like they really are half pigment at least, which is great, but just slightly different to make than lip balms. Brown/Tan Hues: ½ teaspoon (or more for color) of cocoa powder, a tiny pinch of cinnamon or turmeric to get the shade you want (don't use too much turmeric, unless you want your lips to stay yellow for a while). A more Matte texture: ½ teaspoon bentonite clay. Use this with a color so it doesn’t leave a white tint on the lips. Melt the beeswax, shea butter/cocoa butter and coconut oil in a glass measuring container in a small pot of simmering (not boiling) water. It should melt quickly because so little of each ingredient is used. When melted, remove from heat and add any optional ingredients like color or scent . Once all ingredients are mixed well but still liquid, carefully pour into the lip container. I try to fill it until it’s almost overflowing. This reduces the chance of a hole forming as it cools and shrinks. Leave to cool for at least half an hour. Do not allow to set in the sun or it will melt. Plus, shea butter gets grainy if you over heat it. Cooking this once is fine, but you’ll find it grainy if you leave it in a hot car. Notice how much lighter it gets when it cools, so remember to make yours look almost black when it’s hot. Click on the links in the recipe for ideas. oh, I understand. I ordered the shea butter (which I use for lotions, etc) online (2 lbs for $10), and a friend gave me a bunch of bees wax, and I found the oils on sale at a GNC not long ago. But they are not just at your local grocery store for 50 cents. That’s for sure. I’m surprised at how long everything is lasting though. I’ve been able to make so much with a little amount. I hope things go well with you. Good luck! Thanks for the recipe. I recently acquired 2 bee hives and I’ve collected a bunch of wax. I want to try making useful things (candles, furniture polish, lip balm) with them – now I’ve got my first idea! Great! Congratulations on your bees. Love your blog! I can’t wait to try some of these recipes! I tried using beet root but I ended up in a big mess. Any tips??? I’m not sure what your “mess” was like….Make sure you add color in the end when all ingredients are melted together and warm. Let me know what happened and I would be glad to try and help. Thanks for getting back to me so quickly, well I followed the recipe for the lipstick, but when I tried to add the beet root powder, it all sunk to the bottom and looked very gritty. After grinding the powder with a grout and pestle, I tried again. Same result. Am I doing something wrong?? I’ve blended mine with a hand mixer and have never had it clump. It does that with soap, but I’ve never seen it do that with this recipe. Did you try a mixer? Other than that, I’m not sure exactly why yours is clumping up. You can try something else to color color it instead if you’re not having any luck with the beet root powder. There are other options mentioned, you can also use clays. Sorry you’re having trouble. I heard that hibiscus powder works too. What do you think?? I like to use a food processor for blending addends into oils and melted waxes. I also have a very small jar that is made to use with my blender, another excellent choice. 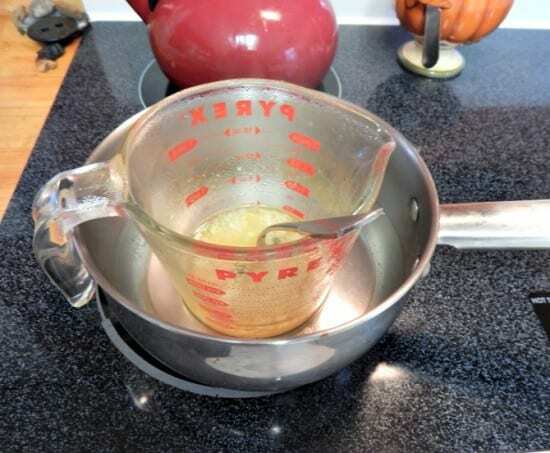 The trick may be to pulverize the powder finely enough (again, the blender may be the go-to) and then to blend the final product until it begins to set up, which would be once it cooled some. I find that works best and can even add small amounts of tisanes with ease and completely incorporate them. So, if the beet addend was rehydrated…who knows? I aspire to be someone like you who does things like this. Maybe someday. Thank you for the shout out! Hey if you can cook a meal, then you can make these things too…just following a recipe. Oh, I love this! Just what I was looking for. Katharine, both recipes come out creamy looking without adding a coloring. It comes out slightly softer, or no different at all, than store bought lip balm. When I make my lip balm I am using a medicine dropper to add it to the container. I fill them all the way to the top, but most of them seem to settle lower in the middle after they harden up. They aren’t level with the top of the container. When they settle sometimes there is a tiny circle showing in the middle. What is the trick to get them all the way full so they are level after they harden? Would a syringe work better for filling the containers? Any advice would be appreciated. Thank you! It’s not what you use to fill them, it’s how they cool. I fill mine until they are bubbled up, about to overflow and it definitely helps. They may sink a little, but no hole. It’s easier on hot days when they cool slower. Thank you! I was just filling them level to the top and I found if I added more later on it would chip off. I’m so glad I found your site, I’ve bookmarked you and can’t wait to try some of your ‘recipes” ……. I’m so glad!!! 🙂 Let us know how things go. It may be the beet root powder you are using. Someone else mentioned that problem, but I’ve never had it. In fact it turns out silky smooth. I would try another brand, like spicesage.com. You can also use clays, alkanet, or hibiscus powder. Thank you very much. I’ll give that a try. Colouring my lipstick with cocoa powder and beetroot powder doesn’t seem to affect the colour on my lips. The product in the container is a deep brown but it goes onto my lips colourless. Any advice please? Yes, it will enrich the color of your lips, but if you want it to really add color you just have to add a lot more beet root and cocoa. You can remelt what you made and add more until it suits your liking. It’s great to have this to refer to. I think a coffee bean grinder would pulverize the beet root powder before adding it to your melting pot. I will do this before I make my first batch. Thank everyone. I learned by reading. I am definitely following. I’ve been starting from roots to toes. I’m up to natural DIY shampoo, conditioner, detangler, dry shampoo, face cleanser and moisturizer. Makeup is next on the docket. Share with me! Blog Hop every Friday (entries accepted until Thursday at noon). Wow, thanks for stopping by! I can’t wait to check out your blog. I miss lipstick. I feel absolutely naked with out it! I will have to try this. Would love it if you will share this with my readers on Oil me Up Wednesdays at My Lamp is Full. I’m loving this! I’m experiencing menopausal acne and covering it up with my make-up. This was next on my list to make. I have all the ingredients but the color. My question is ;if some are having trouble with the beetroot powder, could we add it while the mixture is still simmering so it would dissolve better? also do you have an inexpensive way (on my home computer) that I could print labels? I’ve used very fine beet root powder from myspicesage.com and haven’t had any problems with blending. As for labels, you can download for free and print using Avery, but you’ll need to buy their labels. There’s at least one idea 🙂 Hope that helps. How do you make containers for lip balm without using bottle lids? I buy my containers online, but you can use anything you like. This sounds like a simple easy recipe to make and love the ingredients. Will share on Pinterest & Google. Visiting from Oil Me Wednesday! It’s kind addicting. Now I think…oooh, what else can I make? Another great post. Just found you at barn hop Mondays… Signing up for newsletter! I’ve now used this recipe, and played with it some. It’s just wonderful! I can’t find anything on the market that doesn’t either have frightening ingredients, or something I’m allergic too. Next I’m going to try adding some pure mica for colour. They’re natural, safe and totally non-irritating. I was surprised how reasonable all the ingredients were online- unlike in craft stores!!! 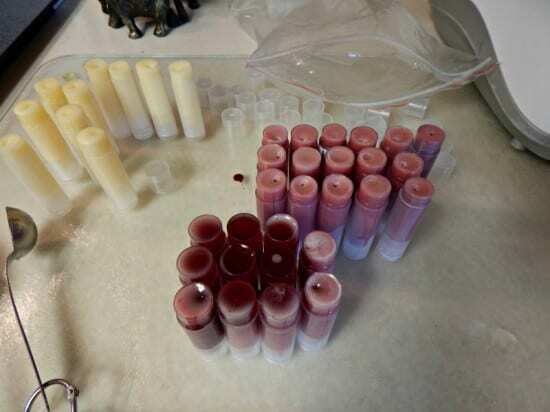 I just made quite a few batches of the lip balm making different flavors. The recipes were very easy and everything turned out great. Now the question is, How do I make the labels? That’s been an issue with me when trying to avoid high costs. What I ended up doing was buying sheets of paper that are sticky on one side, printing, cutting out, and sticking. kelly, i am confused…you are honest and sincere lady and i have made 3 batches with your lip base. 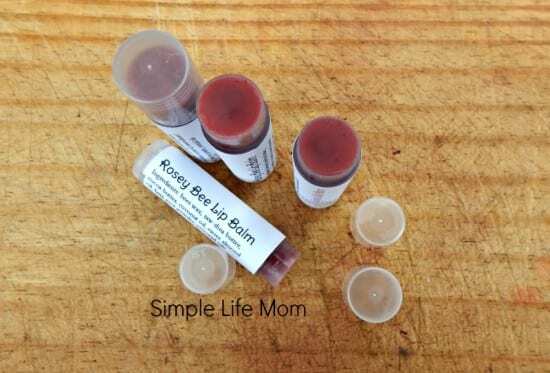 one had food coloring added just b4 poured into liptube, other nutmeg, other tumeric…..all feel like balms on the lips and i wish to do next stage and get vibrant lipstiks like mac and revlon but naturally! If you want more vivid color there are a few things you can do. First, you need to add a LOT of pigment. All colors will get amazingly lighter as is shown in the picture. Secondly, you will need to let it steep over heat for more time, up to an hour over a double broiler. For some reason this really helps the color come out. Hope that helps. I love this recipe, although I have a hard time completely dissolving the beet root powder, any suggestions? Yes, I’ve found that where you get the beetroot powder really does make a difference. I don’t know if some is more fine, or what the deal is. I have had great luck with beetroot powder from myspicesage.com. Secondly, not all will dissolve, but it will dye the recipe much better when stirred over low heat longer. Although it gives a pretty color right away, it’s best to stir it for 10 minutes before removing from heat. I think I got that batch from bulk apothecary but I’ve also bought from Amazon. You have to make it super dark to make it tint the lips. Adding a mica helps as well. thanks a lot for your recipe. would you mind if i use another lipstick materials? Ive found that usage of beetroot water, sesame oil and castor oil with beeswax resulting in awful colorless lipstick.. Im confused why the color bottle lid went to dark brown? could you give me some advice with it? and what time is needed to heat? I’m confused. You used beet root water? I have had some herbs turn brown with heat (especially in soap making), but not beet root. You can try alkanet root powder or hibiscus powder. Could you add in a liquid coloring? Such as concentrated beet or strawberry juice? How about homemade alcohol-based extracts for flavor? As long as it is oil based. Infusing water or alcohol bases into oils can be very tricky and they don’t last long at all. beet root powder is not oil soluble i wonder how you use it? I’ve been using it for years and it turns out wonderfully, so I’m guessing it must be oil soluble.